Indian Democratic system is passing through a grave crisis of implementing the Aadhaar Card. 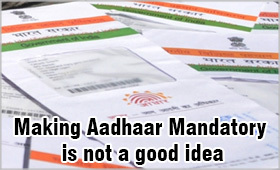 It is difficult to present the views without rightly knowing what the Aadhaar is. The Aadhaar in fact is a 12 digit unique identification number that every resident of India (regardless of citizenship) is entitled to get after he furnishes his demographic and biometric information. Demographic information shall include the name, age, gender and address while Biometric information shall include biological characteristics of the person e.g. fingerprints, eye scan ( iris scan). No Collection of information pertaining to race, religion, caste, language, income or health is made. The Aadhaar number shall serve as proof of identity, subject to authentication. However, it should not be construed as proof of citizenship or domicile. Aadhaar number shall be issued after verification of information collected for the person. Such collected information shall be stored in a database called the Central Identities Data Repository. This repository shall later be used to provide authentication services to service providers. Government of India set up an office of Unique Identification Authority of India (UIDAI) in 2009 within the Planning Commission. In 2010, the government introduced the National Identification Authority of India Bill in Parliament to give statutory status to this office. Government of India requires each and every citizen of India to link their Aadhar number to the Mobile phone connection, Bank accounts, PAN and other services apart from transferring the funds under Government schemes. The earlier extended deadline for linking of Aadhar was extended from December 15, 2017 to March 31, 2018 as the last date for the people to link the Aadhar number to all these services. This decision was challenged in Supreme Court of India who in its order dated March 13, 2018 has extended the date indefinitely till it delivers the verdict on the linking of Aadhar to these services. However, according to Unique Identification Authority of India (UIDAI), Aadhar will be needed for opening new bank accounts or applying for Tatkal passports. So indirectly for opening of new bank accounts, linking of Aadhar is not waived by Supreme Court of India. Implementation of Aadhar has been the subject of a severe criticism from various quarters—cabinet colleagues and bureaucrats, policy experts and activists, even a few state governments. Procedures for data collection and the potential errors therein to concerns over privacy, are being questioned. Besides, the existence of an older exercise, the National Population Register (NPR), led by the home ministry, is also posing a threat to the project. Most of the eminent ones accept the need for creating a systematic database of our citizenry, the path to be taken for this has created a vertical divide in the government and is leading to a turf war. UIDAI’s process of using multiple registrars and enrolment agencies to collect individual data as well as its system of relying on ‘secondary information’ via existing identification documents has become a core debatable issue. The Registrar General of India (RGI) while compiling the National Population Register push for a method of public scrutiny in which individual data is collected directly and put up before the public to weed out any fraud. The method used in NPR helped villagers in Gujarat’s border areas expose ‘strangers’ (from Pakistan) on the rolls when the data was put up for public scrutiny. This reinforced the belief that the NPR process, despite being long and painstaking, is more foolproof. RGI and census commissioner Dr C. Chandramouli found the data collection for Aadhaar faulty and stated “Our objection is to the data collection by other registrars who have a different orientation from ours. From a security point of view, they are not acceptable.” it was felt both programmes could pool their data and share information. But the home ministry has refused to use UID data for NPR. The agencies say the Aadhaar numbers will be issued in about 90 days’ time but in most cases, it takes between four to six months. Many agencies are asking for additional data but they are not communicating to the people that everything is not mandatory and they don’t have to fill up everything in the form. There are many issues with UID’s biometric data collection. Labourers and poor people, the primary targets of the Aadhar process, often do not have clearly defined fingerprints because of excessive manual labour. Even old people with “dry hands” have faced difficulties. Weak iris scans of people with cataract have also posed problems. In many cases, agencies have refused to register them, defeating the very aim of inclusion of poor and marginalized people. Activists also question UIDAI’s authority to collect biometric data. Human rights and UID activist Gopal Krishna,is critical about Aadhaar “There is ambiguity about biometric data. It is not clearly defined in the National Identification Bill. UIDAI also provides for storing biometric data like fingerprints forever while even the Prisoners’ Act provides that this data should be destroyed on acquittal.” Usha Ramanathan activist and legal expert fumes “The whole thing is so illegal. Every statutory organisation can only act within a given mandate and citizen’s rules do not provide for it. The Citizenship Act has nothing on biometric data.” She further says “The whole emphasis is on enrolment with no planning on how this is going to be used.” UIDAI’s system of using introducers to identify and provide numbers to the homeless and those without documents is another grey area. The Public Distribution System is getting worst affected. Going by the system of present fair price shops (FPS), each of them has a specified number of households registered to it. The FPS stores grains only for the registered households. The FPS owner would not know how many migrants, and for what periods, would come in and demand their quota. Hence, for lack of stock, he would turn away migrant workers who demand grains. Therefore, the FPS system is incompatible with the UID-linked portability of PDS. Aadhaar therefore, is engraved with the following risk factors - First, the project would necessarily entail the violation of privacy and civil liberties of people. Second, it remains unclear whether biometric technology — the cornerstone of the project – is capable of the gigantic task of de-duplication. The Unique Identification Authority of India's (UIDAI) “Biometrics Standards Committee” has noted that retaining biometric efficiency for a database of more than one billion persons “has not been adequately analysed” and the problem of fingerprint quality in India “has not been studied in depth”. Third, there has been no cost-benefit analysis or feasibility report for the project . Finally, the so called benefits of the project in the social sector, such as in the Public Distribution System (PDS), are not realistic. Identity of a citizen in the wake of infiltrations from neighbouring countries may be described as the “missing link” in India's efforts to rise as a superpower. Aadhaar may be termed as the technology linked identity drive in right direction. The UID “Aadhaar”project has two different dimensions. The first one is that it is linked to “national security” and the other one is “developmental” concern. Both the factors are equally important. So far the recipient of benefits under various government sponsored schemes has to establish his identity and eligibility many times by producing multiple documents for verification. The verification of such documents is done by multiple authorities. An Aadhaar enabled bank account can be used by the beneficiary to receive multiple welfare payments as opposed to the one scheme, one bank approach. “Aadhaar” shall be able to reduce the involvement of middlemen who siphon off part of the subsidy. In the new system, the cash shall be transferred directly to individual bank accounts and the beneficiaries shall be identified through Aadhaar. The government has firmly planned to transfer benefits under various schemes directly into the bank accounts of individual beneficiaries. The MNREGS, scholarships, pensions and health benefits in all districts are proposed. There are around 34 schemes that have been identified to implement the DCT (Direct Cash Transfer)programme. It can be termed as a good beginning. So far the government subsidies contained products like food grains, fertilizers, water, electricity and services education, healthcare by providing them at a lower than market price to the beneficiaries. This has led to operational inefficiencies. An Aadhaar enabled DCT system will improve the situation and would ensure timely payment directly to intended beneficiaries, reduce transaction costs and leakages. DCTs shall provide poor families the choice of using the cash as they wish. Having access to cash will also relieve some of their financial constraints. Aadhaar would qualitatively restructure the role of the state in the social sector. The UID project is aimed to expand India's social security system and to ensure targeting with precision. The UIDAI claims that UID would help the government shift from a number of indirect benefits into direct benefits. Let us hope that Aadhaar will serve the well intended purpose. Millions are supposed to be covered with ‘Aadhaar’.